For the second part of our iced coffee feature we are looking at the ‘Ready to Drink’ category (If you missed Part I check it out here). In searching out opions we immediately realized that there is a huge range, even within simply bottled coffee drinks at a store. To begin, we focused on national brands rather than specialty companies. Beyond that we decided to start with the least adulterated (read: as close to black coffee) drinks we could find in this national brand sub-category, which turned into more of a challenge than we imagined. Most ready to drink products in stores are flavored, sweetened, diluted, blended, or otherwise made to taste like something other than simple coffee. Mixing coconut water with coffee, milk, and sugar seems like a strange decision, and the results show nothing to prove otherwise. A strong aroma of… something we don’t prefer? Like a sweet, chocolate, sour, and slightly rotten coconut dynamo assaulting our senses. Easily one of the strangest flavor/texture experiences we have ever had, this drink has high and low points. The texture was a big point of discussion for us, and we were reaching for sparkling water to rinse our mouths immediately. If you are a big coconut water fan you might like it more than us. This combination of cold brew and almond milk is clearly enhanced by something unknown from the ingredient list, as the aroma overwhelmed our noses with the distinct smell of Bailey’s Irish Cream and artificial vanilla sugar. On first sip, we were a bit shocked to find that the drink was nothing like its smell. Not very sweet, this drink tastes like burned salted caramel. At first it is quite bitter almond and salt, but then through the resilience of your palate, it turns sweet like caramel popcorn. It is very dense and thick, which we speculate is coming from the range of thickeners on the ingredient list. With an impressive calorie count this drink could work as a meal replacement if your body thrives off of pure sugar. This is one of the products that required shaking, and it is clear that some amount of its ingredients should settle to the bottom of the bottle over time. The aroma is generally sweet, smelling like Whoppers (the malted milk and chocolate candy, not the burger). With the first sip our brains nearly exploded from the intense sweetness. I personally have never worried about developing diabetes from a coffee tasting, but have now reconsidered. It is incredibly thick and cream-like, and it tasted primarily like caramel and vanilla. Not exactly what we were hoping for from bottled “coffee”. The Illy bottled latte was an unexpected find in the grocery aisle. Illy is widely considered the father of espresso, with a long prestige in Italian coffee. You can immediately smell the telltale aroma of denatured proteins, which is common in very high temperature pasteurized milk to make it shelf stable. The specific smell could be described as an off brand Irish Cream that doesn’t quite taste like what you want. In terms of flavor this is not overly sweet, and the coffee presence is hard to comprehend. The general flavor of “coffee” is in there, it’s just masked by whatever else is in the bottle. We found it difficult to understand how a drink could be both creamy and drying at the same time. Added thickeners again could be to blame. Here we have a coffee drink with few additives (though I personally detest sucralose). Visually the drink looks very thin and watery, like weak brewed coffee with skim milk. In the aroma we smelled dark caramel. The kind that almost burned to the bottom of the pan. Upon tasting we were intrigued to find that we tasted almost nothing. There is a faint coffee flavor, but mostly we got the sucralose flavor that presented as super sweet candy. Unfortunately that sweetness quickly changes into a bitter linger on the tongue. Overall the texture is very thin and watery. High Brew coffee is a brand we had never encountered before this tasting. Their Double Espresso poured out looking relatively light. The aroma is sweet and caramel/maple in nature, giving us an anticipation of the first taste. Upon taking said taste, the reality sets in that things don’t always taste as good as they smell. In fact, there is very little notable flavor of any kind. It is lightly sweet, almost timidly so. The milky texture goes so far as to create a clean mouth-feel, though it couldn’t be described as “rich” or “full” when you experience it. A coffee based bitterness is noticeable after you take a few sips, which translates to a less than desirable linger on the palate. The second offering from High Brew is also the only beverage on our list that has no milk or cream type addition. Just coffee and sugar (and a couple of preservatives). It’s not exactly the same as the other drinks, but we had to give it a try. A strong coffee-like aroma is immediately detectable. The nature of this aroma is not particularly coffee “roast” in nature, but more like some sort of malty beer. While the aroma is relatively notable, the taste is slightly woody and flat. Not really bitter but not really sweet, this drink is average and unoffensive. The texture is creamy and smooth, with just enough flavor to remind you what you are drinking. While it is clearly coffee, the finish doesn’t linger, which makes it easy to forget what you just consumed. Our final selection is another from the Starbucks line. This little 6.5oz can packs a lot of flavor, as opposed to the larger sized can which seems to have a different formula. 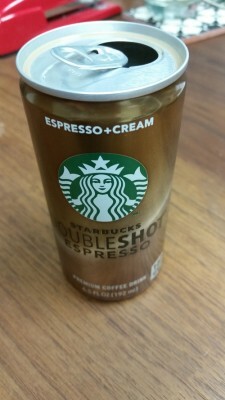 The Starbucks Double Shot tastes more like some of the canned coffees that are produced in Japan, which we think is a good thing. Right off the bat the aroma is sweet, reminding us of Snickers candy bars, but not so sweet as to warrant preemptive insulin injections. On the initial sip the tongue is pleased to find that it hasn’t been fooled by aroma. This drink tastes balanced, with a distinct coffee “roast” note and an appropriate amount of sugar. The chocolate candy bar comes through in the flavor for the most part and gets enhanced by a thick and creamy texture coming from the milk and cream. Our only real complaint is that there is a slightly bitter aftertaste. In the world of commercially bottled (or canned) coffee drinks with milk and sugar we can’t complain too much though. At the end of this tasting day, our tongues were dried out and not happy. Some of the additives, whether for preserving or flavor/aroma/texture enhancement, seem to hang out in an unnatural way. If you are looking for a coffee drink at your local supermarket, we hope this can help give you an idea of what to look for. In our ranking process we looked for the most pleasing flavor representation of coffee. Clearly there are many ways to get your energy/caffeine, and we hope you reach for a coffee option more often than some of the others! 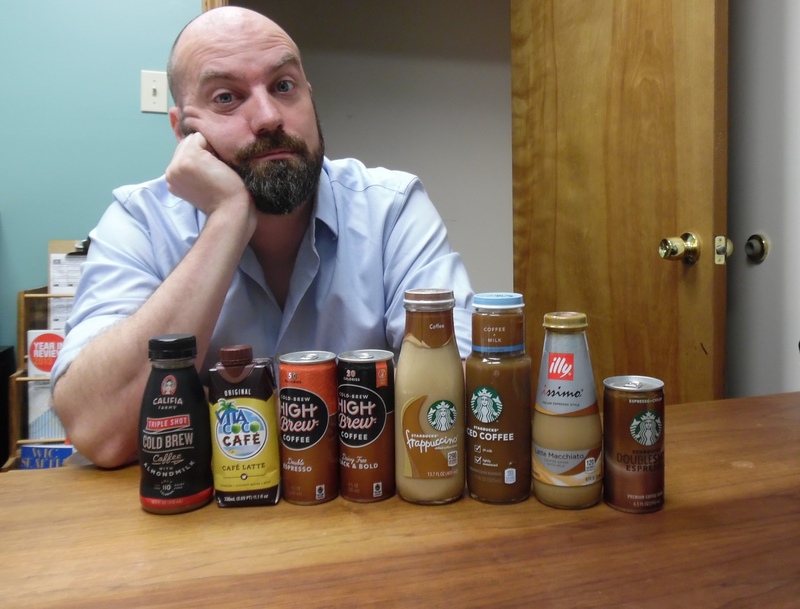 Our next installment of cold coffee tasting will be looking at the growing trend of bottled “Specialty” cold brew options. Love the breakdown of these ready-to-drink iced coffees – thanks! Did the two High Brews you tried have Sativa in them? I’ve tried two of their other flavors (Mocha and Salted Carmel) and they were unbearable…mostly because of the Sativa I think. I’d like to give their straight cold brew a try, if they offer it that is. They did not have Stevia(?) in them. We tried to get options with the fewest ingredients for this one. Looking forward to reading future taste tests! Canned coffee is not at all good idea, i found no one near me who tried these. As they never taste near even our worst coffee. Coffee should give a feel of freshness and a kick, what we expect from Black coffee. I can understand, you guys took a brave decision to taste so many creamy/sweet/chocolaty so called coffee drinks.